The last post was about our psychological roots, how old memories can provide comfort and nourishment. In this sketch I tried to capture our physical roots, how a good bowl of soup can nourish our body and make us remember that we are children of Earth. As a kid I always dreamt of leaving Earth to explore the universe in a spaceship. I thought that being an astronaut must be the coolest job in the universe. 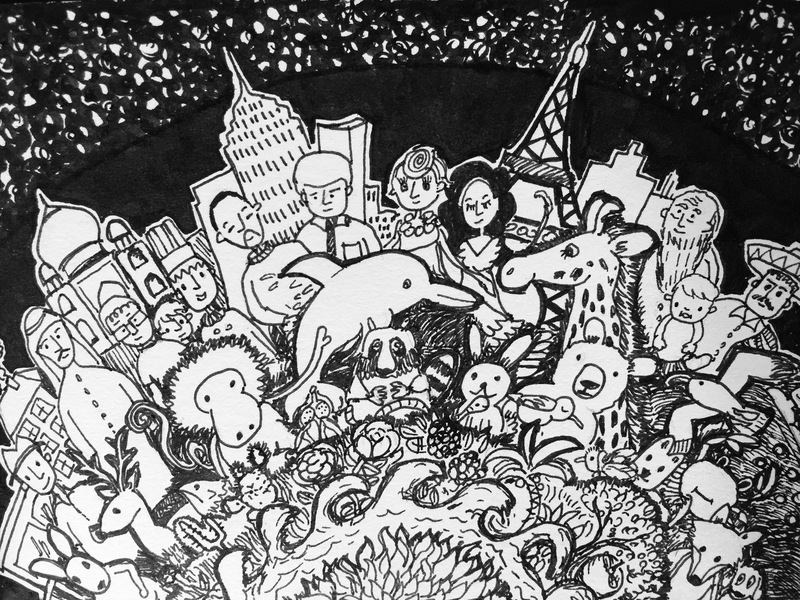 On my mission to Pluto I would probably have pinned this drawing onto my bunk, to never forget the planet I had left behind: The burning fire in its centre, the deep oceans, the jungles and vast prairies, the animals, the people and the buzzing cities. It’s an amazing planet, isn’t it? The conditions on Earth have shaped every cell of our body. Our physicality cannot be separated from our environment. We take in the world with every breath, with every bite. The earth feeds us when we listen to the wind, feel the sun on our skin or find shelter in a city. We are all part of the cycle of life. Worrying about the future, running from meeting to meeting, I often forget how the earth feeds and protects me. Instead of rooting myself in my body, I try to find shelter in my mind. When we’re sick our mind immediately reminds us: “See, I always told you that your body isn’t perfect!” Our body isn’t perfect, but probably this is what makes it perfect. I believe the secret to a better life is to find ways to honour our physical roots. I like to remember this by sharing a hot meal with friends. A simple, honest meal made with regional ingredients. I like to add some spices that remind me of past adventures and foreign countries. A meal like that can both nourish body and soul, reminding us how deeply we are connected to Earth. Ups, I just smell that dinner’s ready now. A ratatouille with ingredients from our garden is waiting for me.